Happy February, friends! I'm linking up with Melyssa over at the The Nectar Collective to share my monthly goals. Did you know that February holds my favorite holiday? I love Valentine's Day. I was never one of those girls to sulk away when I was single but instead I would host a girls Valentine's Day party and they were so fun. I'm sure Valentine's Day being married will be just a great. However on Valentine's Day, I'll be in Idaho celebrating my nephew's birthday and Dave is going skiing with a friend in NM. I guess we will be celebrating early. 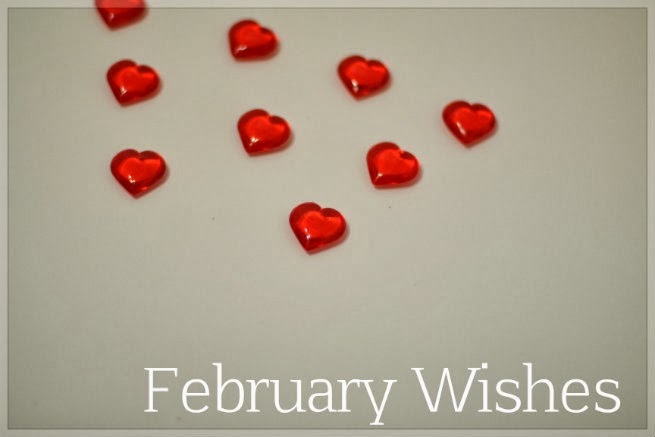 I'm writing to give an update on my goals and to tell you what February holds for SS2SI. For some reason these monthly updates help me stay focused. With my spiritual life I wanted to focus write our verses on prayer, organize a prayer list and pray more intentionally for Dave. I did write out verses on prayer and I was amazed at how many verses are in the Bible on prayer. I also organized my personal prayer list by daily topics. To be more intentional about praying for Dave I'm in the process of writing out 31 days of prayers. This month I want to finish up the prayer cards for Dave and review the verses on prayer. I wanted to remain calm about us moving in June and surprisingly, I am. These are the questions that people have had for us lately: "Where are you going? Where are you moving to? Will you travel? Will you move abroad? Will you get a new PA job?" and the answer is the same "We don't know" and oddly enough, we are ok with not knowing. God knows and He will work it all out. However, please feel free to ask and pray for us. I would ask too if I knew my friends were moving. I wanted to be kind and gracious to Dave. um ... I didn't really improve. I was sick with the flu for almost 2 weeks and I'm grouchy when I'm sick. Dave says I'm nice so I should probably not be so hard on myself. I also wanted to send out 3 FB message, 1 card per week and 1 package per month. I have been doing this but I want to be more organized with it and write it all out. Since February is Valentine's Day and it's all about love I want to share throughout the month some of my favorite things - from hair care product to my favorite blogs to other fun things. I also moved home from Korea 1 year ago this coming Thursday. If there is one thing I could do over, I would have blogged more about my time in Korea. So, I'm going to do a little reminiscing this month and share some of the fun places I got to visit during my time there. February is also the first month I'm offering sponsorships on my blog! You can get 25% off using the code SUNSHINE. For more info click here. What are your goals for the month? How are your New Year goals coming along? I would love to focus on prayer more this month as well. I enjoyed reading your goals! Good luck! Hope you're feeling better, friend! Visiting from Weekly Wishes! I will certainly pray for your upcoming move. Have a great week! Thanks, Abby. I hope you do focus on prayer more. I feel like praying is hard work but worth it. Thanks! I feel much better. The flu is evil, I tell ya! Thanks for visiting and thanks for the prayers! Being a fairly new reader, I'm looking forward to hearing about Korea! Good luck with your goals for the month. Okay, we definitely need to hang out/run together before you move! Where's somewhere cool that we could meet? I can totally come over to OKC. I say early March! So glad that you love Valentine's Day! I have heard quite a few people complain recently that "they don't celebrate the holiday because of commercialism." So, thanks for your refreshing outlook! Thanks, Tammy! That's just so silly of them to not celebrate! I do think it is becoming more and more commercialized but isn't every holiday? The companies are in it for money but I don't think that means we all have to buy into that (good pun, right? ).